Happy Cook the Book Friday Tuesday! My daughter is back to school, so I hope to be back to more regular blogging, at least for now. The next few months will be pretty hectic for my family, so my blogging may be sporadic for the rest of the year. I’m OK with that, but I hope to keep up with my Cook the Book Fridays cooking. We do have to eat after all! The last couple of weeks I have struggled to get it together enough to make consistently decent meals. I blame the change in our after school schedule. Last week was particularly bad. I have always been a meal planner (I usually plan a week at a time), but last week I just didn’t plan well. I failed to fully appreciate just how little time I would have to cook on Wednesdays now, so I resorted to a box of tomato soup. Also, two of my planned meals relied on cherry tomatoes from the garden, but the tomatoes did not cooperate, so I had to wait until I had enough. Hence this late post for the the Cherry Tomato Crostini. Apricot Crumble Tart is a wonderful recipe! I loved the technique for making the pastry dough; it was more like making a cookie dough than pastry. And the crumble topping is fantastic! I have a fondness for crumble toppings, and this one may be the best I have ever had. Rather than making a giant tart, I used my 6″ springform pan. I used half the pastry dough and froze the rest. I cut the filling and crumble topping parts of the recipe in half. It worked out perfectly! That photo up there of my apricot tart looks delicious, doesn’t it? Well, it wasn’t. My apricots were not very good, and they were super tart, ruining the rest of the dessert. My Mom had good luck making the tart with peaches, so I took the extra pastry dough out of the freezer and remade the tart with peaches. Much better! I may just make this with peaches from now on. Cherry Tomato Crostini with Homemade Herbed Goat Cheese it a great way to celebrate the best of summer tomatoes. The cherry tomatoes were roasted simply with olive oil, garlic, herbs (I used rosemary and thyme), salt, and pepper. I allowed them to sit for most of the day to concentrate the flavors. The homemade herbed goat cheese was fun to make! I found a wonderful, semi-locally made, whole goat yogurt that was thick and creamy. After draining it for 24 hours to thicken it even further, I mixed in herbs (chives, thyme, and basil), minced shallot, garlic, cayenne pepper, and salt. The result was delicious! The combination of flavors here is fantastic. The sweet, rich tomatoes, against the piquant goat cheese was delicious. I was very impressed by the homemade goat cheese. It was good on it’s own, and I even scrambled a couple of tablespoons with eggs to make a tasty breakfast. All in all, August was a delicious month! September looks like it will be pretty good too. If you would like to join in the fun, check out the September recipes: September Schedule. It feels like it’s been awhile since I did a Tuesdays with Dorie post (or any post, for that matter). My last one was only a few weeks ago, but considering I had done the baking for it a month or two prior, it feels like longer. Lately my daughter has taken an interest in helping me read the list when we go grocery shopping. She likes to read the list before we leave, then check it with me at the store. She carries the list for me, and helps me find the items. This is a big deal because we have struggled to interest her in functional reading outside of specified “reading time” at school or home. The downside to having her help me read the list is that if the store does not have a particular item, she gets a little sad because her expectations were not met. Even though I assure her I can find the item at another store, she kind of obsesses about it until the item is in our possession. On Sunday, the store we were at did not have tangerines. So she asked me about it for the rest of the day, making sure I would be buying them the next day while she was at school. The cute thing is she pronounced tangerine as “tambourine”. Yesterday when I picked her up from school, sure enough the first thing out of her mouth was, “Did you get tambourines?”. When we got home I showed her the tangerines I bought. I also showed her the tangerine cake I made with them. She liked her piece of cake as much as I liked mine. The other Tuesdays with Dorie recipe for January was Lemon Squares, French Style. While I don’t have photographic evidence, I did make them in November for my mom’s birthday. They were a huge hit and probably the best lemon bars I have ever had. I will definitely be making them again! Happy New Year! I realize I’ve been a missing-in-action the last few months. I have been having trouble finding my blogging rhythm ever since French Fridays with Dorie ended. I have plenty of ideas about what I want to share with you, but so far the execution has not happened. Maybe in the new year? In the meantime, here is a quick and dirty catch-up of the Tuesdays with Dorie recipes I have made over the last few months. What a clever idea! Little mini pies baked in muffin tins. I cut the recipe in half and made six pielettes. My only issue with these was that my filling did not entirely “fill” each pielette. They sure were tasty though! There is only one word to describe this toffee: Wow! It was SO GOOD! It’s a good thing I gave most of this away, because I may have eaten it all within a day or so if I hadn’t. It was very addictive. A Note About Making this at High Altitudes: To make the toffee, you have to bring the sugar mixture to 300° F. At higher altitudes, since the boiling point is lower, you need to bring the sugar mixture to a lower temp, otherwise it will burn. I took mine off the heat at 292° F and it was perfect. To find the appropriate temperature for your altitude, check out this site: http://bakingwithaltitude.com/high-altitude-candy-making-tips/. My daughter and I made these together a few days before Christmas. It turns out we aren’t very good at filling the holes with the crushed lifesavers. I like the way they look though; kind of like water colors. These were fine, but I wasn’t wowed by them. 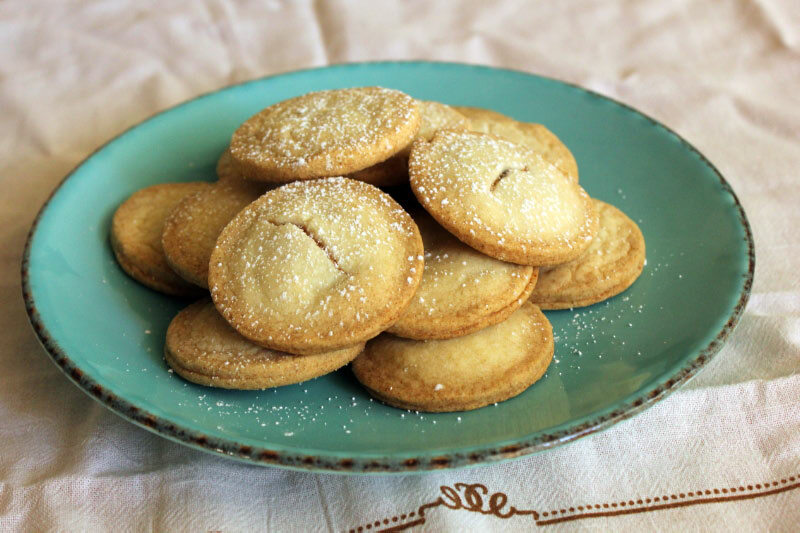 I would make them again as a fun Christmas activity, but otherwise I would skip the lifesavers and make basic vanilla cookies, maybe with a sprinkling of colored sugar on top. I hope 2016 treats all of you well. See you in the new year! Welcome to another edition of Tuesdays with Dorie! This week we made tasty little cakes called Tiger Cakes. Tiger Cakes are a traditional French pastry. 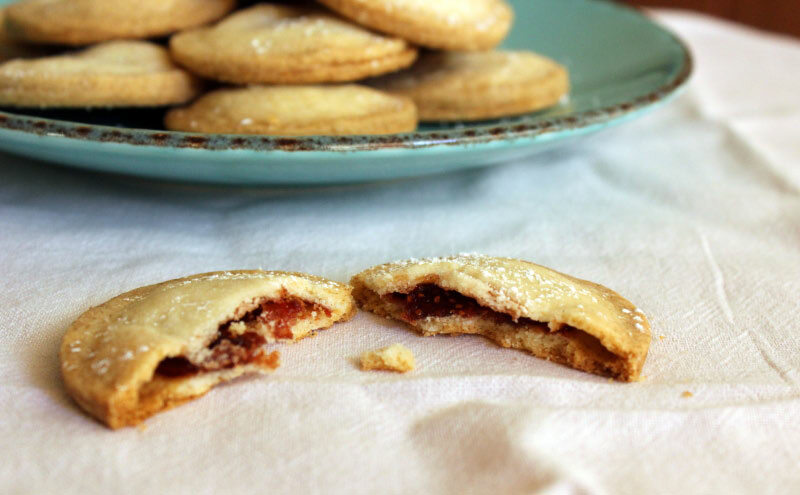 They are made mostly from almond flour and butter, which gives them a moist, tender crumb. 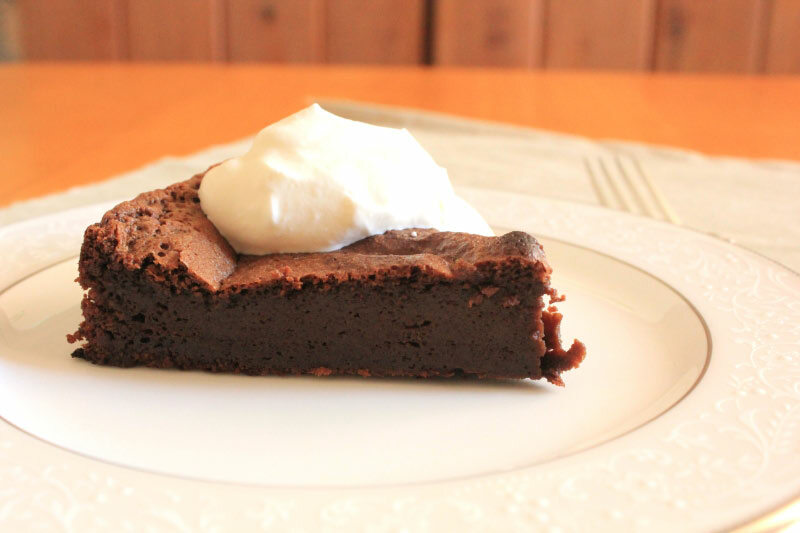 The name comes from the finely chopped chocolate that is added to the warm batter. In theory, the chocolate melts and forms stripes like a tiger. I don’t think I chopped my chocolate finely enough, because my cakes are more spotted like a leopard! 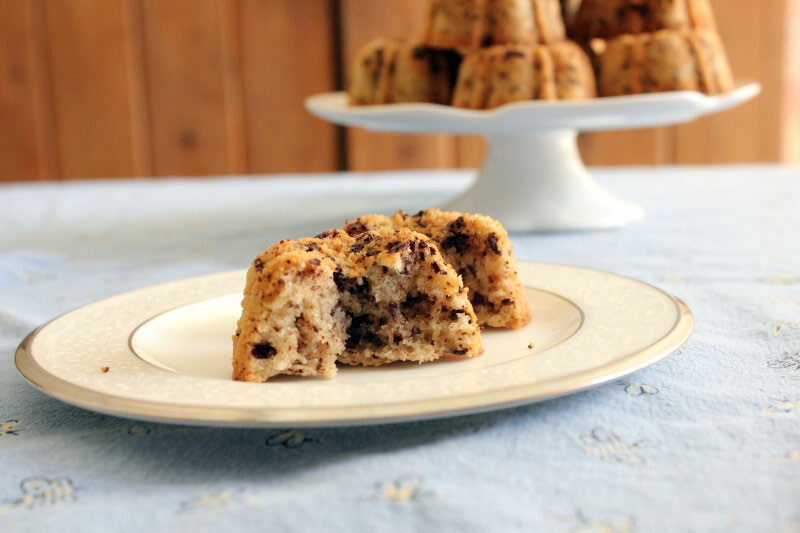 Dorie has us use mini muffin tins to make 24 small cakes. 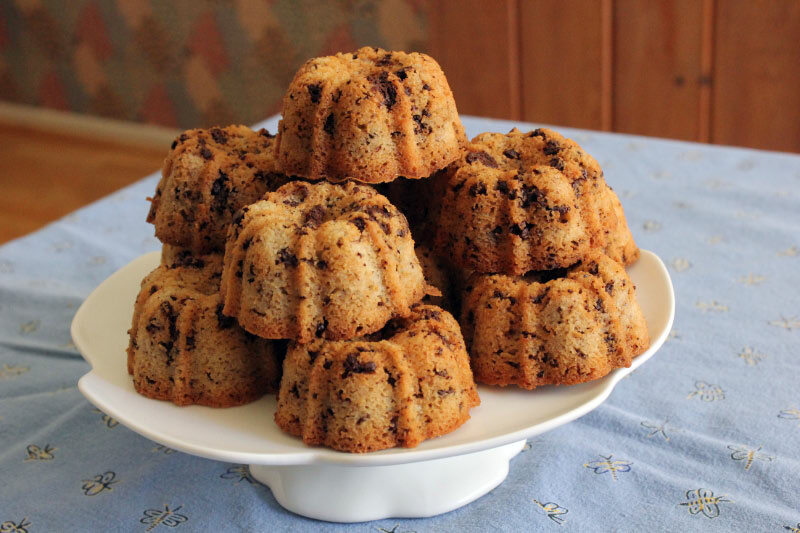 I used a mini bundt pan I got a few months ago for my birthday and got 12 cute bundtlettes. I finally got a chance to try Baker’s Joy, and my cakes popped right out of the pan. I have always struggled getting cakes out of pans (especially bundt pans of any size! ), so this was truly a joy to experience. These cakes are delicious! There is just the right amount of chocolate, and the moist, tender crumb is balanced nicely by a crisp exterior. Dorie is right when she says these go well with coffee. These will definitely be made again! A few weeks ago, TWD had a rewind week, where we could catch up on a recipe we missed or remake a favorite. I chose the Chocolate-Cherry Brownies made by the group in June. 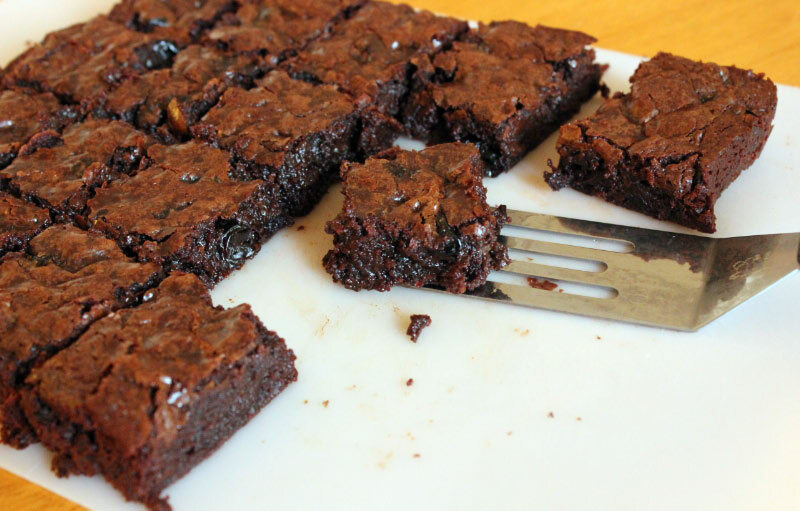 While I made the brownies in time for rewind week, I didn’t get a chance to write about them because that week the whole family was sick with colds. 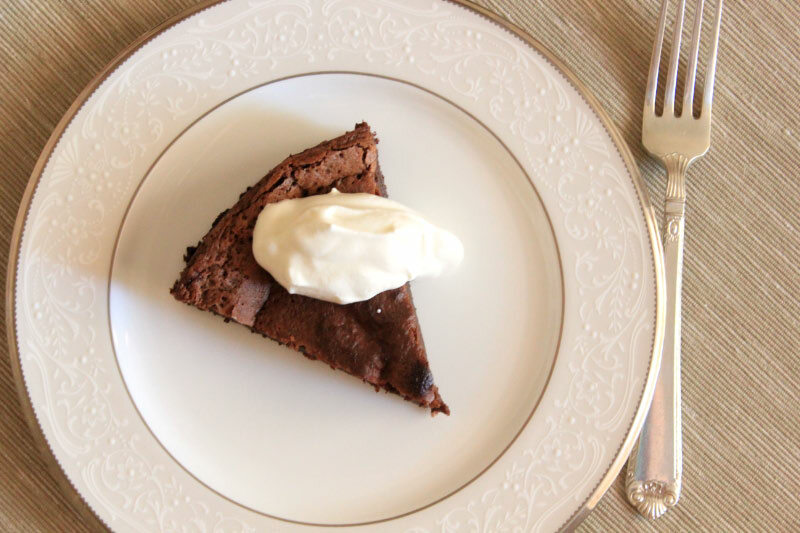 The brownies are delicious – very rich and fudgy. I liked them best cold from the fridge. Although they were good, I’m not sure I will make them again. They were almost too rich, and I like other things better. That doesn’t mean I had any trouble eating them! I am enjoying the Tuesdays with Dorie excuse to bake more often. Look for something perfect for Fall in a couple of weeks! Wow. Here we are at the end of French Fridays with Dorie. We finished cooking through Around My French Table last month, and this week concludes the four weeks of celebratory posts. When I started on this journey over four years ago, I had no idea I would actually cook through every recipe in the book. Though I am pretty stubborn when I set my mind to something! I am proud of myself for finishing, and proud of everyone who finished or came close to finishing. We tried new ingredients, learned new techniques, and made new friends. It was fun cooking the assigned recipe each week knowing my FFWD friends were out there cooking the same recipe, perhaps with their own special twist. My only regret is I haven’t had a chance to meet any of the lovely Doristas in person. I hope to some day! For the Grand Finale we were to choose a recipe and adapt it, try a bonne idée, or simply remake the recipe. I chose to remake Michel Rostang’s Double Chocolate Mousse Cake. When we made this the first time I ran into trouble. Since I was pretty sure I knew what went wrong, I have always wanted to try this recipe again. Besides, what’s better for a grand finale than chocolate cake? I had two problems the first time I made this cake: 1) My pan was too big; and 2) The egg whites deflated when I tried to fold them into the hot chocolate mixture. I bought the correct size pan a few years ago and solved the egg whites problem by using lukewarm coffee instead of hot coffee. My fixes worked and the cake was delicious! This is a great make-ahead dessert because it really tastes best after a night in the refrigerator. A wonderful way to celebrate the end of the book! I don’t quite know how to end this post, except to say that this has been a wonderful experience and I look forward to keeping up with my fellow Doristas as we embark on our next adventures!